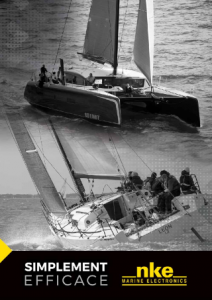 When the J/111 “Xentric Ripper” was sold before the successful Fastnet Race last year, and Robin started looking for a somewhat larger boat to sail with the family, is was quickly decided to go for a J/122E. 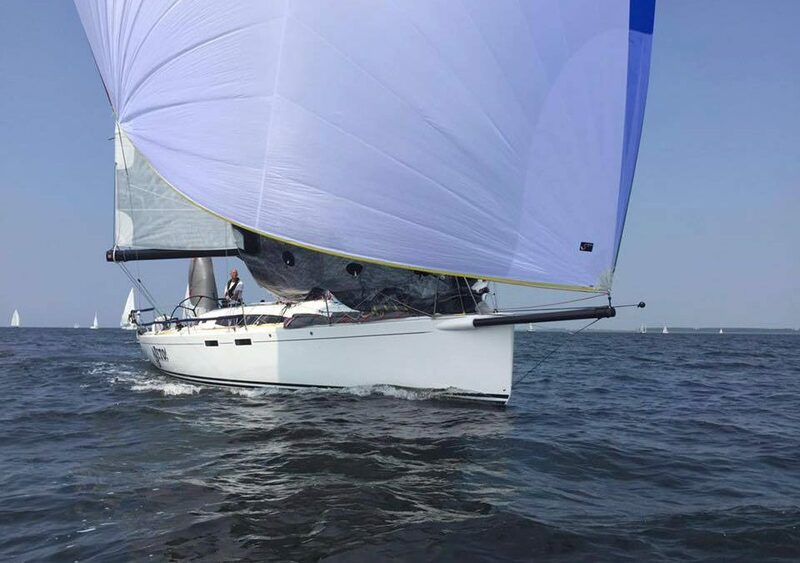 Since we very much enjoyed the double-handed sailing of last year, we now had the opportunity to optimize a brand-new J/122 for short-handed sailing. We changed the standard configuration of the J/122 by shortening the mast by 1 meter, and increasing the draft and weight of the keel, this created more stability so we could sail the boat with less heel without a full crew of 8 on the rail, which is standard on a J/122. After the boat was built by J-Europe it would be on display at Boot Duesseldorf, after which it was transported to J-Benelux based in Stijensas, The Netherlands. Robin and I have been very busy with the commissioning of the boat during the months of February and March. Everything was checked and reviewed; blocks, lines, cleats, heater, systems etc. etc. . Because of the short period of time before the NK races many spare hours and days were invested. In particular the NKE instruments were more advanced than on the J/111. In cooperation with NKE/France we installed a NKE HR Processor with a 3D sensor which senses all the motions of the boat and incorporates that data in the calculations of the TWA from which the autopilot in particular would benefit. “We shall see”. By the end of March the boat was transported to Breskens where a coat of anti-fouling was applied and the Hall Spars mast was rigged. I paid much attention to the ORC(i) measuring certificate, several “trial certificates” were requested from Ab Pasman of the Technical Committee of the Noorzeeclub, to determine what the best sail configuration, weight and other parameters would be to achieve the best possible rating for the boat. Every second “earned” this way contributes towards race results. Particularly in picking the right dimensions of the sails are gains to be made, in my opinion one should optimize the boat for an average wind speed of about 12-13 knots, this will also guarantee that the boat will still move in lower wind speed conditions. A standard J122E is overcanvassed for DoubleHanded sailing, thus was decided to reduce the size of the gennaker as well as the main and jib. Sailing the J/111 shorthanded was useful to help us create a specific idea about the sails. It is imperative to have a sailmaker who understands your requirements and can contribute to your ideas. Multi-champion Kevin Sproul of Ultimate Sails was the person whom we trusted most over time, in a close cooperation with him we created a sail suit which, in spite of the smaller dimensions, produced sufficient power and was easy to handle while fewer sail changes had to be made due to a jib which could be reefed. Also the overlap between the sails was broad enough so that less sail changes had to be made. The kites were chosen based on stability and easy of handling, with the option to sail deep angles when necessary. Also a Code-0-like A-0 should be part of the suit, this sail allows you to generate more power under 90° TWA. All was planned that all that pieces would fall in place in the weekend of 23rd. and 24th. of April when the boat and sails would be measured and all would be “ready-to-go” ! Eventually the boat could not be measured for the OCRi stability measurements, our main sail only arrived the Monday after, but in spite of these small setbacks we were able to test-sail the jibs and kites (together with the old J/111 main) and start calibrating the NKE instruments. Even with the old J/111 main the boat showed a lot of potential and expectations were high. (Some former crew members, who joined us during this test, suggested to sail with “that old rag” in the offshore races). Personally I had an adverse against the Iridium. For the Lightvessel Race and the North Sea Race I think it important that we can download grib-files into Expedition via Iridium. However our state-of-the-art and superfast on-board pc runs on Windows10, but the drivers of Iridium are not yet compatible with Windows10. Despite our efforts and many many hours of frustration we didn’t manage to get this properly going. During the North Sea Race I kind of felt a little “blind on one eye”. If that contributed to the meager result ? Who knows, we’ll just leave it like that, but never again. Also the measuring certificate was a concern; although all details were supplied to the “Association” in time , no certificate was released by the Rating Office. The 5-day limit before the race to present a certificate had already lapsed, eventually we were glad that we received our certificate the Sunday prior to the start of the Lightvessel Race. On the Monday before the start of the Lightvessel Race we completed our preparations for the race, we started to feel the excitement ……… will all our ideas and preparation going to pay of? The weather forecast was for light winds, particularly for the start 5-8 knots was predicted. It made us wonder if the sail configuration that we designed would turn to be too risky in the lower wind band. Or would be just fine ? With only two days of testing in 20+ kts. of wind, we weren’t too sure about our plan. So we left the dock early to sail a number of legs to find the correct sail trim settings. Tuesday 19:00 hrs. start of the Lightvessel Race! Together with Panther we had a good start at the pin end of the line, after a minute we tacked and cleared the rest of the field on Port tack, promising ! We rounded the windward mark in first and put the A1 up. Darn…. the snuffer got stuck ! Good begin! At mark NAM22 we doused the A1 the conventional way, through the cabin hatch, no risks! In the meantime we built up a nice lead with the rest of the field and it was well after NAM22 when the Volvo70 “Sanya” passed us. The NKE autopilot (nicknamed “Fred”) does an outstanding job, we only steered the boat by hand from the start to the first mark, after that we left the job of driving the boat entirely op to him. One can drive a boat fully concentrated for about 20 mins. but after that one loses some of the “edge” because of distraction and fatigue, something “Fred” is not affected by, he keeps his full concentration infinitely, very stable and no swaying, very impressive! We constantly monitored the % of performance, the numbers were telling us that we were on and at times over 100%. The weather forecasts were mixed, which made me decide not to rely on those we considered unreliable, we choose to go for the straight line to North Shipwash, thus a nice loop to the North, first taking advantage a favorable tide running North to approx. 3.5 miles from the rhumbline and then with an ebbing tide going South. We were somewhat restricted in taking a more favorable loop North by one of the many drillplatforms obstructing our course, we had to settle for a smaller loop. “Maverick” and a few other boats tried to transit through the safety zone but were ordered by VHF radio to change their course, this costed them some valuable time. In spite of some ups and downs due to fickle winds, we still managed to keep the boat going, and finished as 5th Overall and 1st in the Double-handed Division. From there on we were waiting mode for the competition to finish. As we are monitoring AIS it becomes apparent that our lead would be sufficient to secure 1st. in Class and fastest overall in fleet on corrected time! Not bad for a first showing in light air !